A partir du 17ème étage et ses 180 degrés de vue terrasse face à l'océan et de Tierra Bomba Island, vous pouvez regarder des croisières et des bateaux à cargaison dans le port de Carthagène juste en face de vous .Cet appartement 3 chambres à coucher, a toutes les commodités et a été équipé mobilier neuf, moderne, élégant et confortable. Il est privé et ascenseur panoramique vous mène à son entrée privée et un salon avec sa cuisine ouverte et salle à manger (table se trouve 8). Un den avec porte coulissante séparant du salon dispose d'un canapé-lit et de bain et demi. Bel appartement moderne avec un grand balcon surplombant la mer comme sur une passerelle de bateau. Tout confort avec en plus le bruit des vagues. A Perfect Stay in Cartagena! 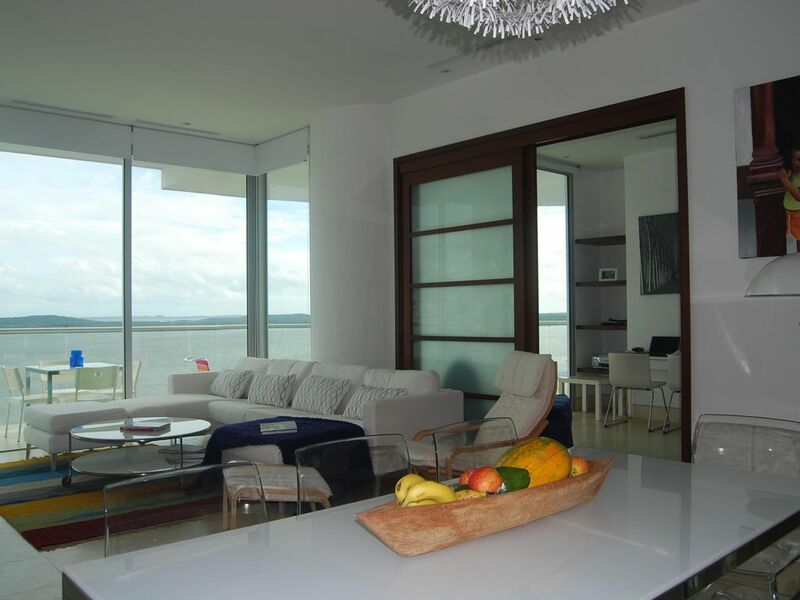 This is a beautiful, tastefully decorated, luxury apartment in Castillo Grande, a very exclusive area of Cartagena. It is spacious, clean, fully equipped for a family of 5, and has a breathtaking view of the Caribbean Sea, which is accessible to enjoy from just across the street. It is also has a view of the Cartagena Bay, which can be accessed by a short walk, providing an inspiring stroll that leads into the commercial area of Boca Grande. There are very limited services nearby, such as restaurants. Only a small corner store can be found about a half mile away. Prepare to walk a bit or take taxis to access supermarkets or restaurants. Access to the apartment is by a keyed front elevator that opens directly to the living room. Remember to lock the elevator access to the 17th floor. There is also an elevator outside a keyed door that leads to the kitchen. Also remember to give the hot tub sufficient time to warm up before using. And be careful not to step off the glass platform in the lobby waiting area by the couches or you will fall into the decorative water below. The shower in the garage entrance outside of the lobby will clean the sand from your beach outings so that you do not bring it into the apartment. There is a housekeeper, Maribel, that is employed by the owner to keep the apartment clean and tidy during your stay. She is there from 9-5, unless you request her to not be there. She is unobtrusive and very helpful. She will even cook for you on request if you offer her money to buy the ingredients. If you do, make sure to leave extra food aside for her to eat as well. The glass doors leading to the balcony are so clear, you must be careful to take notice if he door is closed when stepping on to the balcony. The doormen are very friendly and helpful. The owner, Armelle, will provide very helpful tips to make sure you enjoy your stay. The only downside to this apartment is that you will not want to leave at the end of your stay. We hope to return again soon. Absolutely beautiful location and apartment. I cannot say enough about the wonderful apartment. The daily sunset was incredible from our balcony. I pool overlooks the beach... just perfect. Loved the kitchen!!!! I did some cooking and all I needed was there. Thank you again for a fabulous vacation. Fantastic property located on the Castillo Granda peninsula. Panoramic views of the beach , Caribbean, and Terrabomba Island. This expansive property has great common areas both inside and out, allowing gatherings with the entire family. Air conditioning in bedrooms kept them cooled for great sleeping. And having Maribelle available to assist was a great bonus. The apartment was very clean and well maintained. I would definely visit Cartegena again and would certainly stay at Plaza Del Mar again! Very nice place, safe and nice building. Maribel was great! She was attentive and made surw our requests were met. Would come back. 1 Amazing Week in Cartagena! This apartment is more beautiful and amazing in person. We have a wonderful time. We were a group of 8 (6 adults, 2 children) and we had plenty of room. The pool over looking the ocean was beautiful. We were literally right across from the beach and the front desk and office staff were very attentive. This apartment has a maid/service person who was very friendly and trustworthy. She helped us out with advice and the food she cooked was delicious. The owner was very attentive and followed up with us periodically to ensure we were satisfied with the apartment. We'll definitely stay here again in the future!!! Thank you very much for your good comments ! I am always very pleased to know my guests had a good time and enjoyed my place ! I hope You come back soon ! No single men parties allowed ! This is a residential building , therefore we expect that our guests will behave correctly and respect the neighbors in the commun areas like pool, gym etc . (loud music, radios , TV , music groups and alcoholic beverages are forbidden in the pool) . No noise or loud music on the terrace after 12AM For security reasons,no visitors can be allowed which are not announced before arrival.